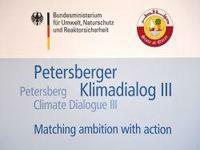 I delivered my proposal/concerns to bold delegates and media at the closing press conference of the Petersberg Climate Dialogues III. Please check-out my 1-pager handout. * There is growing awareness that bicarbonate sequestration and the exploitation of natural and societal-agricultural processes in the SOIL-WATER-VEGETATION-ATHMOSPHERE Nexus and further consideration to consider life and thinking styles and diets can yield important results to counteract climate and degradation processes. * There is an International Encyclopedia of Systems and Cybernetics done by a French and Spanish speaking Scholar and Diplomat which explains in Easy words the terms needed to grapple with systemic/holistic/cybernetics concepts and defines them in respective subject areas. 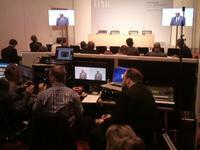 The presentation of the Editor in Chief when introducing the Second Edition can be found here. The Message? We do not need to get perplexed any more in such vague subject areas. Let us go beyond shying away when we encounter mindboggling challenges! *Definitely, they are not only smart but intelligent solutions, as where asked for in the lobbies and in the casual sections of the informal gathering. I mean Mindprints description that have incredible Handprints ! maybe start with "Dolphin Solutions" as the Futurist Robert Jungk has initiated. * We are still perplexed in view of the Complexity, Dynamics, Sectors, and Scales involved and try with single issue agendas to address inter-sectoral strategic dilemma. Recommendations delivered annually by the Council on Global Issues and the Earth Focus Foundation in Geneva and Recommendations directly through UN diplomatic channels seem to not reaching international organisations, Science, Media and the public. Maybe it is too mindboggling…. Approaches and Studies to establish a public domain World Press Center (WPC) have been filed by the World Bank, but seemingly too early. * Proposals in the UN-AMR 2008 process have not been really fully explored and translated to the Challenges we face after Rio+20. For example already in the process to prepare the CSD between 1989-1992 the intersecorial strategic dilemma where studied not only with interdependence voting as mentioned above, but also by creating tableaus to see interdependencies and how issues interrelate and single issue strategies like any one-eyed approach are doomed for failure. See the 3rd Volume: ACTIONS _ OPTIONS _ STRATEGIES. 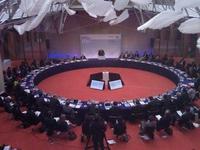 See the Rio+20 page below. Besides - we did such interventions as Civil Society quite often - here an example from the UN-CSD 15 as you will see, wording is very important, between people and in UN declarations... check "Climate Crisis" approach to our "bold delegations" 5 years ago. I propose to check ARTE television tonight, as it makes sense to talk about the same thing: "LIMAWANDEL oder nach uns die Sintflut?" - Climate Change, après-nous le Deluge? .... THE WHOLE EVENING Themenabend !!!! [link] we can not continue talking for 20 or 40 years about Environmental Change, we finally have to get our acts together !!! I am getting very concerned. All is known and extreme worsened the last 22 years when we were documenting it for the Global Change exhibition: landslides, forest dieback research, evacuation planning in Germany, Austria, Switzerland all well documented for the UN Year of the Mountains (2001) See also the article reflecting on UN-IYM 2002Summit, about Space and Spatial, flat and deep! !, Potential and "Emptiness" and how this evolved, or was created by developing the "chain of methods" TOPOGRAMM 1987 to make a difference, "dent the trend", but we failed utterly... - and worse the experts and academia around environmental research and communication did not even take note, see the "LEXIKON of Sustainability", those days and now !! They simply "forgot" the GLOBAL CHANGE exhibition 1990, THE LOCAL and GLOBAL CHANGE exhibition 1991, the Climate International Coordination exhibition 1995, Un Climate Summit 1995 in Berlin.... See the 1985-2012timeline. Why !?? May I guess? Maybe ignorance, fear, narrowness, jealousy, dumbing down creativity, narrow box-thinking, laziness, ... and what I wrote about mindboggling, shying away from anything perplexing, complex, and out of reach and touch... yes we need to explore not our diets and life-styles, we need to check how we think, communicate, learn !!! - our labelling, box-thinking, fixation and love of details, so we now more and more about less and less. Neglecting what is in-between and beyond, and what connects !! check: and maybe also Deep- and Flatworlds here. Advisors who have seen the system evolve feel we should look at the source of the problem, not some symptoms and syndromes, not tipping points (only) but LEVERAGE POINTS (Donella Meadows). But what has happened? Little, nothing towards positive outlooks or trends if you keep the scales, proportions, consequences in mind. This on the surface, if you look deeper, respected heads of national GLOBAL CHANGE Secretariats are now looking into Water in the Eastern Mediterranean, the Global Change - WELT IM WANDEL - Challenges to Sciences of Politics was about to be disposed.... fortunately we were able to save some of many elements, which show what we knew and did not act upon the last 25 years.... Fortunately, many boards of the exhibition have been saved - recently shown at an exhibition of Berlin of municipal environmental offices. Just for the record: have a look at: GLOBAL CHANGE retrospective inquiry The exhibition I am curating now was updated a few time between 1990 and 1997 - The Changes? Taking out some posters...., changing the picture of the President of the German Federal Republic riding a bicycle.., and always changing the YELLOW section: Research Devices, Equipmet, Programmes,.. maybe we should do a long term evaluation of research and management funding one day . My concern, getting lost here in the middle of the night after watching the ARTE documentation: When are we going to see the patterns that conect, the frames and the details, and avoid selfish isolation!?? (I called "Positions and Identities in Global Contexts: Awareness of Self and Others with me, you, we, they and "others" models"in Paris at UNESCO HQ with Club of Budapest) and come to shared frames of references as requested by Noel Brown, Director UNEP-RONA in NYC and admin of Rio92 and presented for him in summing up the Rio exercise FIG, Melbourne 1994. So in a nutshell, are we willing to collect the will and the wisdom of the people [link] and go beyond the need to agree or "win" to invest in collective efforts in view of "Big Pictures" ?? instead of perplexed, mindboogling dumbing us down and cultivating Ignorance [link] see also Mother Earth and Pelican: and so in avoidance or negligence putting our heads into the sands, play the blaming game, as is typical for the bargaining we experienced... and forgetting the fundamental Elements and Processes !!! we need for survival.